In the following Preterist Bible commentary on Revelation 15, the seven angels receive the bowls containing the seven plagues of Revelation 16. 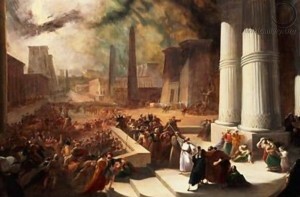 Before the angels release the plagues, Revelation 15:6 says, “Out of the temple came the seven angels with the seven plagues.” In A.D. 66, just prior to the fulfillment of the seven plagues throughout the course of the Jewish war as explained in Revelation 16: A Preterist Commentary, Josephus writes, “[A]t that feast which we call Pentecost, as the priests were going by night into the inner temple…they felt a quaking and heard a great noise, and after that they heard a sound as of a great multitude, saying, “Let us remove hence.”’1 Did Josephus record the departure of the seven angels from the Temple in Revelation 15:6? After crossing the Jordan while fleeing the war with Rome, the Jewish Christians presumably sung the song of Moses as the Hebrew slaves had done after crossing the Red Sea. 1I saw in heaven another great and marvelous sign: seven angels with the seven last plagues—last, because with them God’s wrath is completed.2 2And I saw what looked like a sea of glass mixed with fire and, standing beside the sea, those who had been victorious over the beast and his image and over the number of his name. They held harps given them by God 3and sang the song of Moses the servant of God and the song of the Lamb: “Great and marvelous are your deeds, Lord God Almighty. Just and true are your ways, King of the ages. 4Who will not fear you, O Lord, and bring glory to your name? For you alone are holy. All nations will come and worship before you, for your righteous acts have been revealed.” 5After this I looked and in heaven the temple, that is, the tabernacle of the Testimony, was opened. Roberts, David. 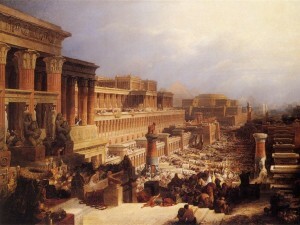 The Israelites Leaving Egypt. 1830. Birmingham Museum and Art Gallery. Revelation 15:1-5 Preterist Commentary: After crossing the Jordan on Their Way to Pella, the 144,000 Jewish Christians sing the Song of Moses as the Hebrew Slaves of Exodus had done after crossing the Red Sea. According to v. 2, those who had been victorious over the beast are seen standing beside the sea. V. 2 corresponds with Revelation 12:14 in which the woman flees to the desert in order to escape the serpent of the sea. The woman of Revelation 12:14 and the people in v. 2 are the 144,000. These Jewish Christians fled to Pella in order to escape the wrath of God manifested by the war with Rome. After safely crossing the Jordan on their way to Pella, these Jewish Christians sing the song of Moses as the Hebrew slaves of Exodus had done after crossing the Red Sea. And just as the Jewish slaves of Exodus witness the drowning of Pharaoh and his army, these Jewish Christians also witness the deaths of their enemies in a similar, though more figurative, flood. 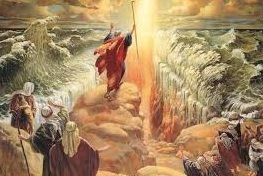 Floods are often used in the Bible as a symbol of a conquering army. And because the earth represents Israel and the sea, Gentile Rome throughout the Book of Revelation, a flood is a perfect metaphor to describe the destruction of Israel, the earth, by Gentile Rome, the sea.3 See In the Bible “Earth” Signifies the Specific Land Addressed While “Sea” Symbolizes Foreign Nations and The Poetic Biblical Link Between “Sea” and “Abyss”. .
6Out of the temple came the seven angels with the seven plagues. They were dressed in clean, shining linen and wore golden sashes around their chests. Preterism, A Commentary of Revelation 15: Does Josephus Record the Departure of the Seven Angels from the Temple in A.D. 66? In v. 6 the seven angels of the seven plagues come out of the temple. The departure of the seven angels from the temple is also described in Revelation 14:15, 17 and 18. Describing what may be the departure of the seven angels of the seven plagues from the temple at the start of the Jewish War, Josephus writes, “[A]t that feast which we call Pentecost, as the priests were going by night into the inner temple…they felt a quaking and heard a great noise, and after that they heard a sound as of a great multitude, saying, “Let us remove hence.”’4 See Revelation 14: A Preterist Commentary, Revelation 17: A Preterist Commentary and Revelation 18: A Preterist Commentary. 7Then one of the four living creatures gave to the seven angels seven golden bowls filled with the wrath of God, who lives for ever and ever. A Covenant Eschatology Interpretation and Commentary of Revelation 15: The Seven Plagues Mirror the Plagues of Exodus in Fulfillment of Deuteronomy 28:60. These seven bowls are presumably the same golden bowls described in Revelation 5:8 containing the prayers of the saints. These are prayers for vengeance, and as will be seen in the next chapter, each bowl results in a different plague. These plagues are designed to call to mind Deuteronomy 28:60. Here God threatened Israel with the plagues of Egypt as punishment for their disobedience. In order to hold true to this promise, each of the seven plagues of Revelation 16 mimics a different plague of Exodus. John describes these plagues in the next chapter. In this preterist commentary on Revelation 15, the seven bowls of Revelation 16 are about to be poured, and the supernatural departure of the seven angels from the Temple appears to be recorded in the annals of first century Roman history. Josephus The Wars of the Jews 5.6.3. In Daniel 10:6, the prophet is visited by an angel. This angel is said to have a voice like that of a multitude. Josephus describes the voices of the angels in the temple in much the same way. A similar and seemingly independent account is found in Tacitus The Histories 5.13: “A sudden lightening flash from the clouds lit up the Temple. The doors of the holy place abruptly opened, a superhuman voice was heard to declare that the gods were leaving it, and in the same instant came the rushing tumult of their departure.” The descendants of Levi were required to wear linen while ministering in the temple. The seven angels of the seven plagues are dressed like Levitical priests. Interestingly, people who have had near death experiences often report encounters with angelic beings and loved ones dressed in what appears to be fine white linen. For a detailed explanation of the ways in which these Christians mirror the Hebrew slaves of Exodus during the crossing of the Red Sea see the preterist commentary on Revelation 14:20. The song of the Lamb is also mentioned in Revelation 14:3. Verse 8 is another Exodus reference (Exodus 40:34-35). This v. says, “[N]o one could enter the temple until the seven plagues of the seven angels were completed.” Does this mean that the saints could not enter heaven at the resurrection until the seventh plague was completely fulfilled at the fall of Jerusalem? This may be the case; however, this verse only says that no one could enter the Temple in heaven until the seven plagues were completed. It never says the saints could not enter heaven before that time only that they could not enter the Temple in heaven before the seven plagues were completed. Even if the saints could not enter heaven until the seven plagues were completed this still does not mean that the saints could not enter heaven before the fall of Jerusalem in A.D. 70. In Revelation 16:17 the seventh angel pours out his bowl on Israel and the consequences of the seventh plague begin to unfold. After the angel poured out his bowl at the start of the seventh plague, the voice of God from heaven declares, “It is done.” Does this mean that the plague is considered fulfilled once it began to unfold or is it only truly completed until it has entirely unfolded? I am inclined to believe as implied in Revelation 16:17 that the seventh plague was completed when it began to unfold. The reason that I believe this is because I believe that the 144,000 are the earthly counterpart of the untold multitude of spirits that had been raised from the dead at the start of the Jewish War in A.D. 66. And it was approximately three and a half years from the start of the resurrection recorded by Cassius Dio at the beginning of the construction of the canal in Greece to the sounding of the seventh trumpet by the Romans marking the start of the siege of Jerusalem in A.D. 70. This is the interval in which the woman is kept safe from Satan according to Revelation 12:6 and 14. The fact that no one could enter the temple until the seven plagues are finished means that the spirits resurrected at the start of the war in A.D. 66 cannot enter heaven until the fulfillment of the last plague, three and a half years later. The Roman assault began on the Feast of Tabernacles in A.D. 66 and the seventh trumpet was blown at the start of Titus’ siege of Jerusalem on Passover of A.D 70, three and a half years later. Though it is hard to pinpoint precisely when the resurrection witnessed at the Corinth Canal recorded by Cassius Dio transpired, it is certainly possible that it occurred three and a half years before the sounding of the seventh trumpet, during the Feast of Tabernacles in A.D. 66. During this three and a half year period, as prophesied in Revelation 12:14, these resurrected spirits recorded in Roman History 63.16 were kept safe from the Devil until the sounding of the seventh and last trumpet. This verse agrees with 1 Corinthians 15:52 which states that the dead will be raised at the last trumpet. The last trumpet may be the seventh trumpet and bowl of Revelation 11:15 and 16:17. Therefore, these spirits enter heaven after the death and resurrection of the two witnesses recorded in Revelation 11:11. Jesus the son of Ananus, the two witnesses, was killed during the Passover celebration at the last trumpet in A.D. 70, when Titus began his assault on Jerusalem. As both king and high priest (Revelation 11:4), Jesus is the two witnesses of Revelation 11. See Revelation 11: A Preterist Commentary–Who are the Two Witnesses? After being kept safe for a time, times and half a time, the spirits of the departed presumably follow behind Jesus and enter into the presence of God in heaven.